VANCOUVER, BRITISH COLUMBIA--(Marketwire - Feb. 1, 2011) - Golden Reign Resources Ltd. (the "Company" or "Golden Reign") (TSX VENTURE:GRR) is pleased to announce the final results from its 2010 regional sampling program conducted in the northern block of its San Albino-Murra Gold Property (the "Property"), Nicaragua. The Murra District is host to several newly discovered gold prospects bearing significant precious metal mineralization. 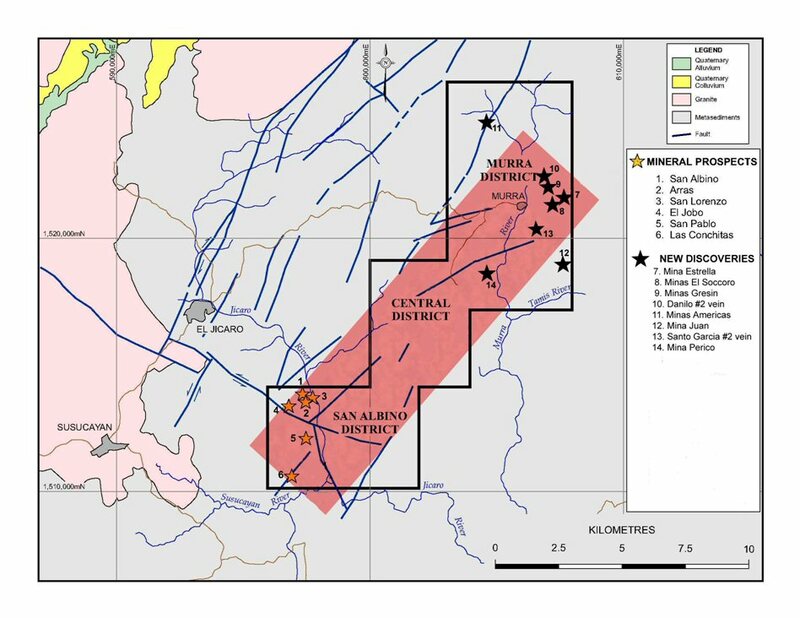 Located in close proximity to Mina Estrella, which returned very high-grade gold samples, the new targets merit further investigation and suggest that this district has the potential to host significant resources in possible open-pit targets. Minas Perico consists of several old artisanal underground workings, many of which are collapsed. Tunnel #1, approximately 10 metres in length, was abandoned by artisanal workers prior to reaching the targeted gold bearing quartz vein. The highest gold values received to date from schist were received from sampling Tunnel #1. Vertical samples were collected from the entire length of Tunnel #1, which is partially collapsed. All samples returned elevated gold values. Samples taken at the face (end) of the tunnel in the host schist rock containing quartz veinlets up to 5 cm wide returned significant gold mineralization, including 52.43 g/t gold over 1.1 metres. Schist rock contains gold mineralization only when located within a few metres of a mineralized vein. Sampling suggests that the adit was stopped within five metres of a mineralized quartz vein. The Danilo prospect is a 4.5 metre wide quartz vein, situated near Mina Estrella. The prospect appears to be part of a system of parallel structures related to Mina Estrella. The following chip sample was collected over the entire witdth of the vein. The Minas Juan area hosts three collapsed tunnels. The Company sampled old mine dumps from two of the three tunnels, which returned excellent results. The mine dumps are estimated to be 8 metres thick, containing quartz veinlets presenting as boxworks within schists. The quartz veinlets are often chaledonic with quartz-adularia stringers containing sulphide mineralization and visible gold. Mina America is situated within an area of limited, historical high-grade sliver production. The tunnels are collapsed; however, the Company collected a multi-ounce silver sample from the old mine dump. This area requires further exploration. John M. Kowalchuk, P.Geo, a geologist and qualified person (as defined under NI 43-101) has reviewed the technical information contained in this news release. Golden Reign Resources Ltd. is a publicly listed (TSX VENTURE:GRR) mineral exploration company engaged in exploring the San Albino-Murra Property located in Nueva Segovia, Nicaragua. Held under a 25 year mining license expiring February 3, 2027, the property covers an area of 8,700 hectares (87 sq km). The Company has outlined a structural corridor approximately 3 kilometres wide by 15 kilometres long, which spans the Property, stretching from Las Conchitas in the south to the northeast mining town of Murra. Old workings exist along the corridor. The San Albino Mine flanks the northwestern edge of this structural trend. Under the terms of the option agreement, the Company may acquire an 80% interest in the Property over a four year period by making cash payments totalling US$450,000, issuing 4,000,000 common shares from treasury and incurring aggregate exploration expenditures of US$5,000,000. Forward-Looking Statements: Some of the statements contained herein may be forward-looking statements which involve known and unknown risks and uncertainties. Such forward-looking statements are subject to a variety of risks and uncertainties which could cause actual events or results to differ materially from those reflected in the forward-looking statements, including, without limitation, risks and uncertainties relating to political risks involving the Company's exploration and development of mineral properties interests, the inherent uncertainty of cost estimates and the potential for unexpected costs and expenses, commodity price fluctuations, the inability or failure to obtain adequate financing on a timely basis and other risks and uncertainties. Such information contained herein represents management's best judgent as of the date hereof, based on information currently available.